For the past few months, my newfound love for easy homemade bread got sidelined by my difficulties with excema. Even easy bread sort of requires being able to use both hands. So it was back to the Costco multigrain loaves for sandwiches and toast. It’s always pained my frugal soul that a certain amount of every storebought loaf is wasted; the younger kidlet balks at crusts, and nobody likes the heels, me included. I tried saving them for breadcrumbs but … I just don’t usually cook things that require breadcrumbs. I wanted to share my bread pudding technique. I can’t call it a recipe; I tend not to follow recipes unless I’m baking (and sometimes not even then), and I rely more on looks and taste than measurements. Bread pudding is perfect for this, as it’s one of the most forgiving dishes ever. Bread pudding recipes call for white bread, preferably French, which we don’t eat. But whole wheat and multigrain crusts and heels work quite well. (Not rye though — flavor’s all wrong.) We go through bread quickly enough that I can usually keep the crusts in the fridge, but if you’re worried about mold just keep a container in the freezer and thaw when you’re ready to make the bread pudding. I’m not including quantities here because you’ve got a huge amount of leeway in the proportions. If you have fewer eggs, or less milk, or only a partial can of pumpkin, no worries! It’s almost impossible to mess this up. This latest time I had about ten cups of bread crust bits, which completely filled a 9″x13″ baking dish, so all my listed amounts are relative to that. You could go with as few as four cups of bread or maybe even three, in a smaller dish. 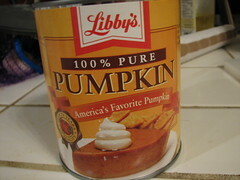 With the ten cups of bread I used an entire 29-ounce can of pumpkin (more vitamin A! ), but a 15-ounce can would have worked fine too, or anything in-between. I used four eggs, but you’re safe with anything from two to five. I used two cups of half-and-half, then (because I had so much pumpkin) thinned the mixture with a little extra skim milk. If you’re worried about fat content, use milk alone, or all cream if you want it really rich. Again, the actual amount is highly flexible — ultimately, all that matters is that you can pour the resulting mixture … more like a batter than a dough. We try to keep a low-glycemic diet around here, so I used pourable Splenda. White or brown sugar also works, of course. One cup made for a lightly sweet pudding, but you can adjust to taste. I also prefer the slight tartness of cranberries over raisins. Generously add spice — whatever from the list above you have on hand, to taste. This last time I used some of everything except the allspice, including fresh minced ginger (because I had roots but no powder). Melt some butter in a shallow baking dish. Put the torn bread bits in, tossing them around a bit. If you’re adding dried fruit, sprinkle that on top of the bread. Mix everything else in a separate bowl and pour it evenly over the top. Bake at 350° until the custard is set — probably between 20 and 40 minutes. I like it warm with just a touch of maple syrup drizzled over the top. I guarantee even the pickiest kidlet will eat their crusts when served like this!